SUNRISE, Fla. (AP) — Ask Florida forward Vincent Trocheck who the best three players in the NHL are right now, and the first two names he offers wouldn’t surprise anyone. Pittsburgh’s Sidney Crosby would almost certainly be on everybody’s list, so he was an easy pick by Trocheck. Same goes for Edmonton’s Connor McDavid, the NHL’s two-time reigning scoring champion and brightest young star. But that third name is of somebody that the casual hockey fan still might not know, and that’s something the Panthers are determined to change this season. 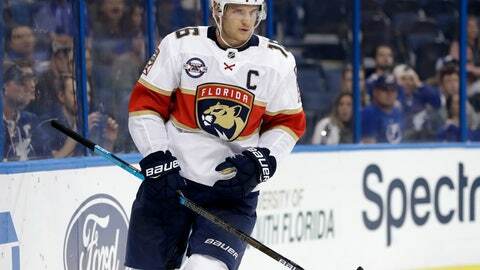 Yes, Florida thinks Aleksander Barkov is elite. The Panthers’ hopes rest on being right. Barkov led the Panthers with 78 points last season, three more than Trocheck. He went to the All-Star Game Star for the first time, led the league with five shorthanded goals, tied for fourth in the NHL with eight gamewinning goals. And he showed the Panthers enough growth that the team decided it was time to make the 23-year-old Finnish center their captain starting this season. It’s his team now, without question. Consider the magnitude of Luongo’s statement — “the most complete player” — for a second. Luongo has played with some serious greats: Pavel Bure, Joe Nieuwendyk, Daniel Sedin, Henrik Sedin, Mats Sundin, Ryan Kesler and Jaromir Jagr among them in the NHL, say nothing of the absurdly loaded teams he’s been part of representing Canada at the Olympics. He insists it’s not just current-teammate favoritism. Barkov is that good, fueled in large part by the lessons he learned by playing with Jagr. So Barkov is Florida’s star. He’s not a reluctant star. He’s just reluctant to talk about being said star. Florida doesn’t get on national television often, has been to the playoffs only once in Barkov’s five seasons and hasn’t won a playoff series since he was 9 months old. That creates an ironic situation — the Panthers want more people to know who Barkov is, and Barkov wants minimal if any part of getting additional attention. When told about how effusive Luongo was in his praise, Barkov shrugged. “Lu can joke sometimes,” Barkov said. It was then made clear to Barkov that Luongo was serious, as was Trocheck. Finally, almost grudgingly, Barkov accepted their sentiments. Florida missed the playoffs by a point last season, and a team that has touted itself as young and building knows it’s at the point where it’s time to take the next step. The Panthers are certain that Barkov can get them there.